After a slow start to the season Arsenal are finally firing with all guns blazing. A dominant display from the Gooners, ending with a well deserved tennis-score victory, albeit helped out by a shoddy Southampton defence. The first half was played with a high intensity, and the Saints were punished for their poor positioning and inability to win/keep the ball. 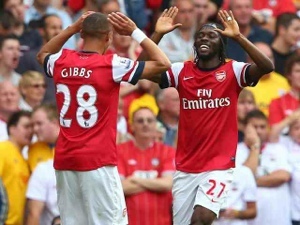 Gibbs flew down the wing twice and got two low and dangerous crosses in, both resulting in own goals after their defenders were incapable of getting it clear; for goals 1 and 4. Santi, let me shoot this. as if he knew from the moment it was won, it was his moment. Arteta once again showed a world class side to his performances, with a cheeky little through ball, perfectly weighted, one which only the best could do. Gervinho was on hand with a curved run to thump it home. After a moment of madness from Szczensy to make it 4-1 and concede our first goal of the season in a truly disappointing manner, Gervinho returned to the score sheet once again. A goal superbly created by Aaron Ramsey, a mid second half substitute, involving him running round 3 players and pushing it to the far post (which it hit) with the outside of his foot. Deserve a goal, but when luck’s against you, it goes all the way, and the ball rebounded to Gervinho who anticipated well to slot home. Sixth and last goal from Theo Walcott from the edge of the area, although the defence and keeper were out of position. He took it well. But a muted celebration from the winger-stroke-forward. Perhaps the lesson Wenger wants to teach him is that if he wants to start, he should sign a new contract. Next up, Montpellier in our first Champions League game. The spotlight is intensely on Giroud, should Wenger give him the go ahead as expected.